We have some exciting news here at SPOCE that may be of great interest to you and your organisation. 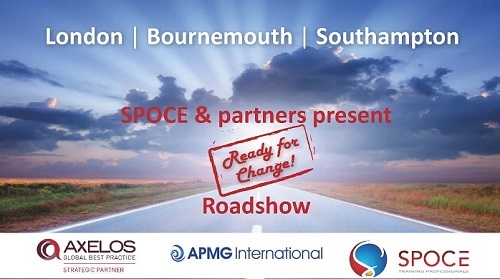 In the coming weeks, with the support of our partners APMG and AXELOS, we will be holding a series of events that will address the theme ‘Ready for Change’ in the Project Management world. Implementing and embedding change successfully underpins project, programme and portfolio management and this summer, with implementation of the PRINCE2 2017 changes, there is no better time to address this subject. Underpinning our ‘Ready for Change’ theme - find out all that you need to know about the new PRINCE2® 2017 changes: when they are happening, what this means for you and your organisation and get a chance to win the new PRINCE2® 2017 manual in our prize draw. Eagerly anticipated, the PRINCE2 2017 update has been introduced to reflect our ever-changing and dynamic working environment. Learn about the new inclusions in the update syllabus, what changes have been made to the exams and what PRINCE2 2017 means to anyone holding, or thinking of gaining ‘PRINCE2 Practitioner status’. An overview of ‘Change Management’ presented by esteemed Change Management author Nicola Busby and SPOCE Client & Partner Manager Sarah Mullins. Gain an understanding of the impact of change to organisations and the individuals within them and learn more about the tools and techniques used to make any transition as smooth and effective as possible...with the chance to win a copy of Nicola’s new book. A complete overview of project management approaches. Learn how the wide range of project management methods available, including PRINCE2®, APM, Agile and Change Management, complement each other. Where they sit on the career path and how, when implemented, they can support any organisation embracing change. If you have any more questions, then please don’t hesitate to reply to this email or call on the number below. SPOCE Project Management Limited is a global leader in delivering best practice training for project programme and risk management. They offer a wide range of courses which can be tailored to suit any form of training need. For example, public courses e-Learning, blended learning and client workshops. SPOCE is the flagship training provider for PRINCE2 and MSP and were APMGs first ever training provider.